Happy Friday and thanks for taking the time to visit the Great Impressions Blog. This month is flying by and before you know it Valentine's Day will be upon us. I make a lot of Valentine's cards -how about you?? I decided for my card today to make a Valentine card using non-traditional colors. I thought this one definitely had a little girl look with the colors I chose. And, I have the little girl in mind who will receive this one. 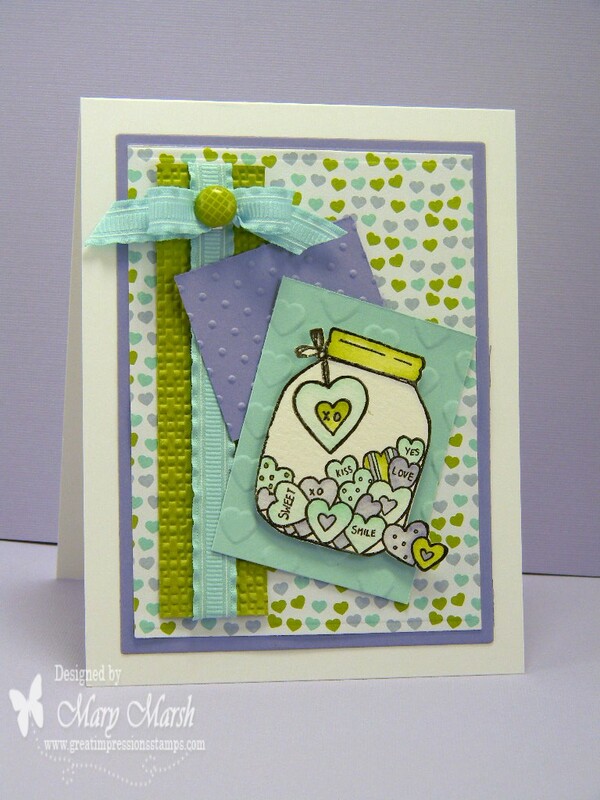 I used the Great Impressions stamp - Jar Candy Hearts E565. I stamped and wet embossed it on watercolor paper and then colored with various dye inks and a blending pen. I fussy cut it and used 3-d glue dots to mount it on the blue heart background panel. I have some great news with this image -you can get it or any other of your choice for 10% off in the online store. And, if you spend $25 you can get free shipping. It's a great deal. 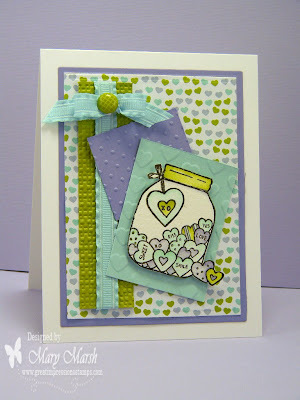 I used 3 different embossing folders for my background panels and added ruffled ribbon to complete my card. That's it for me for this week. See you next Friday!! Great dimension and fun colors Mary! Fantastic Mary! This is one of my favorite Great Impressions stamps! Wow, I love this in the non traditional colors. Thanks for sharing. Really cute! I love the colors you used. Such a great break from red and pink.